Conservative presidential nominee Hong Joon-pyo on Friday launched ideological attacks on liberal and progressive groups in an apparent bid to rally traditional supporters behind his campaign. The candidate of the Liberty Korea Party has been struggling to boost his anemic campaign in the race dominated by liberal candidates Moon Jae-in and Ahn Cheol-soo. During a meeting with business leaders, the tough-talking former prosecutor claimed that North Korea sympathizers who are "disguised as progressives" have been ruining the nation's civic consciousness, and that they are part of "accumulated evils." 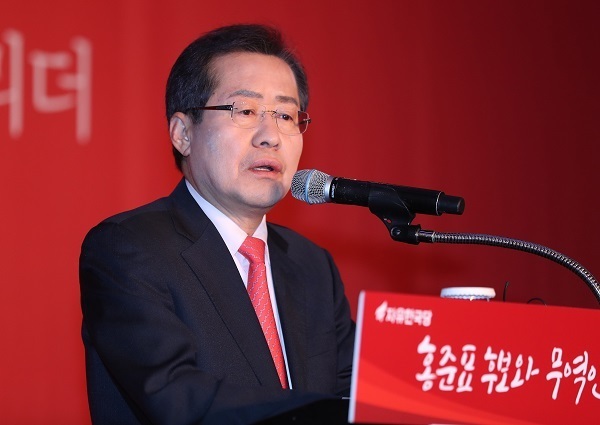 "Should the government be taken up by the progressive, leftist group as we are undergoing the impeachment case (involving former President Park Geun-hye), our economic policy as well as security will face problems," Hong said during a meeting with local exporters. His invective came as his support ratings continue to remain in dismal single digits. In the latest survey released Friday by local pollster Gallup Korea, Moon scored 41 percent, followed by Ahn with 30 percent and Hong with 9 percent.